In reality, AEI is talking about dismantling entirely the obstacles that have prevented the US and the corporate-financier interests that direct it, from installing a client regime and extracting entirely Venezuela’s wealth while obstructing, even dismantling the progress and geopolitical influence achieved by the late President Hugo Chavez throughout South America and beyond. Now is the time for US diplomats to begin a quiet dialogue with key regional powers to explain the high cost of Chávez’s criminal regime, including the impact of chavista complicity with narcotraffickers who sow mayhem in Colombia, Central America, and Mexico. Perhaps then we can convince regional leaders to show solidarity with Venezuelan democrats who want to restore a commitment to the rule of law and to rebuild an economy that can be an engine for growth in South America. Of course, by “Venezuelan democrats,” AEI means Wall Street-backed proxies like Henrique Capriles Radonski and his Primero Justicia (Justice First) political front, two entities the Western media is already gearing up to support ahead of anticipated elections. Primero Justicia (Justice First) was co-founded by Leopoldo Lopez and Julio Borges, who like Radonski, have been backed for nearly a decade by the US State Department. Primero Justicia and the network of foreign-funded NGOs that support it have been recipients of both direct and indirect foreign support for at least just as long. Image: US State Department document (archived) illustrating the role National Endowment for Democracy (NED)-funded NGOs play in supporting US-backed opposition figures in Venezuela. The US regularly fails to transparently list who is included in extensive funding NED provides opposition groups in Venezeula, so documents like this give a rare glimpse into the names and dynamics actually involved. As was suspected, NED money is going into networks providing support for current presidential candidate, Henrique Capriles Radonski. In this particular document, NED-funded Sumate’s legal trouble is described in relation to its attempted defense of Radonski. 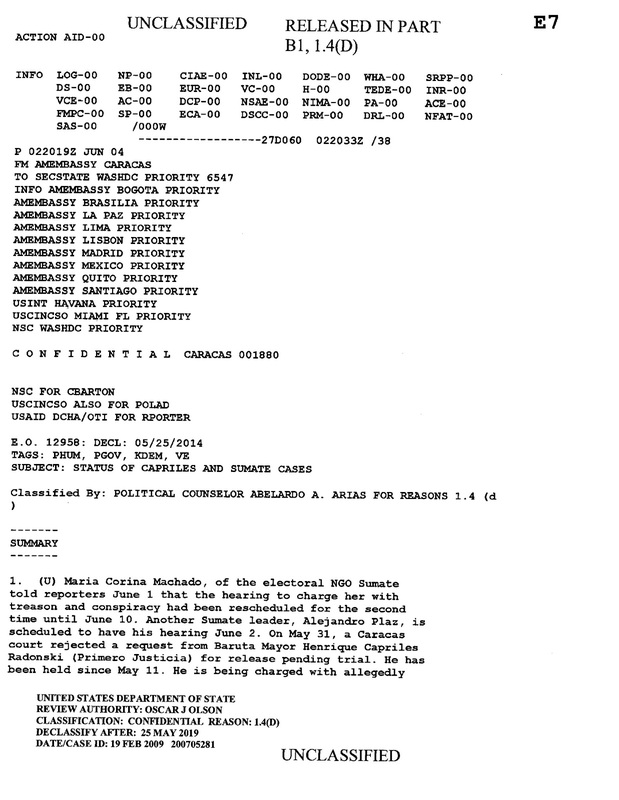 At the time this document was written, Radonski was in jail pending trial for his role in facilitating the 2002 US-backed failed coup against President Hugo Chavez. The document may still be online at the US State Department’s official website here. All three co-founders are US educated – Radonski having attended New York’s Columbia University (Spanish), Julio Borges attending Boston College and Oxford (Spanish), and Leopoldo Lopez who attended the Harvard Kennedy School of Government (KSG), of which he is considered an alumni of(and here). John P. Holdren, Samantha Power, Lawrence Summers, Robert Zoellick, (all as faculty), as well as Ban Ki-Moon (’84), Paul Volcker (’51), Robert Kagan (’91), Bill O’Reilly (’96), Klaus Schwab (’67), and literally hundreds of senators, ambassadors, and administrators of Wall Street and London’s current global spanning international order. Harvard’s Kennedy School of Government (KSG) is clearly one of several universities that form the foundation of both creating corporate-financier driven globalist-international policy, as well as cultivating legions of administrators to execute it. To understand fully the implications of Lopez’ education it helps to understand the leadership and principles guiding Harvard’s mission statements, best exemplified by KSG’ Belfer Center, which to this day, lends its public support to Lopez and his Primero Justicia opposition party. 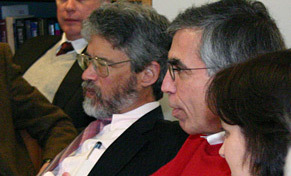 Image: John P. Holdren (bearded, left), an advocate for population reduction through forced sterilization overseen by a “planetary regime,” is just one of many “colorful” characters to be found within the halls of Harvard’s Kennedy School of Government from which Primero Justicia co-founder Leopoldo Lopez of Venezuela graduated. To this day, KSG provides forums in support of US-backed opposition bids at seizing power in Venezuela. Named after Robert Belfer of the Belco Petroleum Corporation and later, director of the failed Enron Corporation, the Belfer Center describes itself as being “the hub of the Harvard Kennedy School’s research, teaching, and training in international security affairs, environmental and resource issues, and science and technology policy.” Robert Belfer still sits in as an International Council Member. Belfer’s director, Graham Allison provides an example of self-serving corporatism steering US policy. He was a founder of the Trilateral Commission, a director of the Council on Foreign Relations (CFR), a consultant to the RAND Corporation, Director of the Getty Oil Company, Natixis, Loomis Sayles, Hansberger, Taubman Centers, Inc., and Belco Oil and Gas, as well as a member of the advisory boards of Chase Bank, Chemical Bank, Hydro-Quebec, and the shady International Energy Corporation, all according to his official Belfer Center bio. Last but not least, there is John P. Holdren, also a Council on Foreign Relations member, science adviser to both President Clinton and President Obama, and co-author with Paul Ehrilich, of the now notorious “Ecoscience.” When Holdren isn’t brand-building for “Climate Disruption,” he is dreaming of a Malthusian fueled totalitarian global government that forcibly sterilizes the world’s population. He feared, erroneously, that overpopulation would be the end of humanity. He claimed in his hubris filled, fact deficient book, “The No Growth Society,” that by the year 2040, the United States would have a dangerously unsustainable population of 280 million he called “much too many.” The current US population is over 300 million, and despite reckless leadership and policies, it is still sustainable. One could argue that Lopez’ education is in his past, independent of his current political activities, however, the interests driving the agenda of the Belfer Center are demonstrably still backing his Primero Justicia party’s bid for seizing power in Venezuela. Lopez, Radonski, and Borges are to this day still receiving substantial funding and support through NGO networks funded directly by the US State Department’s National Endowment for Democracy, and is clearly favored by the Western press. Furthermore, the CFR, Heritage Foundation, and other corporate-financier driven think-tanks have all come out in support of Radonski and Primero Justicia, in their bid to “restore democracy” American-style in Venezuela. With Chavez’ passing, the names of these opposition figures will become mainstays of Western reporting ahead of anticipated elections the West is eager to have held – elections the West is well positioned to manipulate in favor of Lopez, Radonski, and Borges. Whatever one may have thought about Venezuelan President Hugo Chavez and his policies, he nationalized his nation’s oil, forcing out foreign multinational corporations, diversified his exports to reduce dependency on Western markets (with US exports at a 9 year low), and had openly opposed corporate-financier neo-imperialism across the globe. He was an obstruction to Western hegemony – an obstruction that has provoked overt, depraved jubilation from his opponents upon his death. And while many critics are quick to claim President Chavez’ policies are a “failure,” it would be helpful to remember that the US, on record, has arrayed its vast resources both overtly and covertly against the Venezuelan people over the years to ensure that any system outside the West’s sphere of influence inevitably fails. As Venezuelan democrats wage that struggle against chavismo, regional leaders must make clear that Syria-style repression will never be tolerated in the Americas. We should defend the right of Venezuelans to struggle democratically to reclaim control of their country and its future. Only Washington can make clear to Chinese, Russian, Iranian, and Cuban leaders that, yes, the United States does mind if they try to sustain an undemocratic and hostile regime in Venezuela. Any attempt to suppress their self-determination with Chinese cash, Russian arms, Iranian terrorists, or Cuban thuggery will be met with a coordinated regional response. US military contractors and special forces had been caught operating in and around Venezuela. Just as there were warning signs in Syria years before the 2011 conflict began, the US’ intentions of provoking bloodshed and regime change in Venezuela stretch back as far as 2002. Just as Syria is now facing a Western-engineered proxy war, Venezuela will too, with the AEI already declaring US plans to wage a Syria-style proxy war in South America. US development agencies should work with friends in the region to form a task force of private sector representatives, economists, and engineers to work with Venezuelans to identify the economic reforms, infrastructure investments, security assistance, and humanitarian aid that will be required to stabilize and rebuild that country. Of course, the expectation will be that all the costs of these activities will be borne by an oil sector restored to productivity and profitability. Finally, we need to work with like-minded nations to reinvigorate regional organizations committed to democracy, human rights, anti-drug cooperation, and hemispheric solidarity, which have been neutered by Chávez’s destructive agenda. As the US openly funds, arms, and backs Al Qaeda in Syria, conducts global renditions, operates an international archipelago of torture dungeons, and is only now wrapping up a decade of subjugation and mass murder in Iraq and Afghanistan that is still claiming lives and jeopardizing the future of millions to this day, it is difficult to discern just who the AEI’s target audience is. It is most likely those who can read between the lines – the corporate-financier vultures waiting for the right moment to strip Venezuela to the bone. The fate of Venezuela lies in its people’s hands. Covert destabilization must be faced by the Venezuelan people, while the alternative media must do its best to unravel the lies already being spun ahead of long-planned operations in “post-Chavez Venezuela.” For the rest of us, we must identify the corporate-financier interestsdriving this agenda, – interests we most likely patronize on a daily basis, and both boycott and permanently replace them to erode the unwarranted influence they have used, and will continue to use against the Venezuelan people, as well as people across the globe.